SIOUX CITY, Iowa (CNS) — Holy Cross-Blessed Sacrament sixth-graders started Lent on Valentine’s Day — sort of. 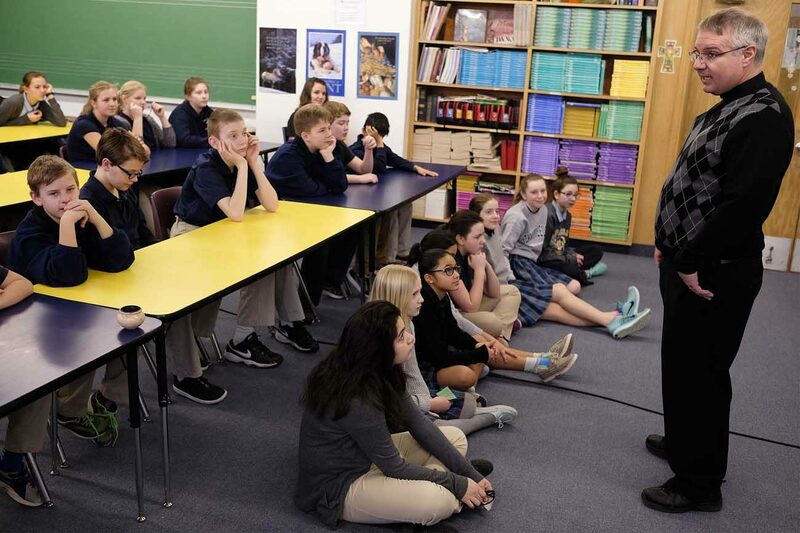 Father Daniel Rupp, pastor of Blessed Sacrament Church in Sioux City, took time Feb. 14 to talk to the students about the importance of Ash Wednesday, the first day of the Lenten season. This year it is March 1. “How many days is Lent?” the priest asked. “Forty!” was the nearly unanimous response. The 40 days associated with Lent is an imitation of the 40 days Jesus spent in the wilderness after his baptism, explained Linda Harrington, former associate professor of theology at Briar Cliff University in Sioux City. Harrington pointed out that since Sundays are not fast days, counting back 40 days beginning with Holy Saturday, and skipping the Sundays, one lands on a Wednesday. Father Rupp discussed the three aspects of the penitential season with the students — prayer, fasting and almsgiving. For fasting, Father Rupp admitted many might be giving up candy, as he planned to do. Student Ethan Lamson also planned to give up candy for Lent, but he was uncertain what others in his family might be giving up. “What are you giving up?” he asked his twin brother, Max. “I’m giving up listening to my mother,” he responded, then corrected himself at Ethan’s horrified look. “I mean, I’m giving up NOT listening to my mother,” Max clarified. Father Rupp acknowledged most people associate almsgiving with money. Before going through an exercise of placing ashes on students’ foreheads, Father Rupp discussed the meaning behind the ashes. Although students had correct answers for almost all of Father Rupp’s questions, he stumped them with his inquiry on whether Ash Wednesday was a holy day of obligation, which it is not. Sister Esther Mary Nickel, associate director of the Sioux City Diocese’s Office of Worship, felt many Catholics attend Ash Wednesday services because there is a longing for the hope of eternal life. “It is a time to overcome self-absorption and to look to others and, with the help of God’s grace, to serve others by the corporal and spiritual works of mercy,” she said. Harrington felt many people attend Ash Wednesday services because “we all have a sense that our relationship with God” could be better. Student Grace Nelson agreed with the “public” aspect of the sacramental.